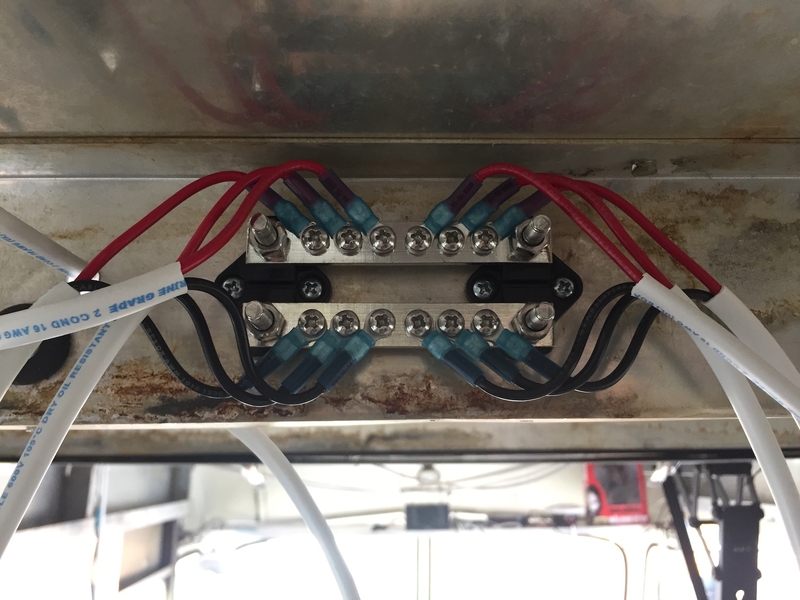 Today I removed some ceiling panels and wired up the bus bar for the aft lighting bank. You may remember that the original ceiling was just one or two long sheets of aluminum. But my modular ceiling panel idea is paying off. After Olivia and my Dad helped dry-fit them all into position last month, it was just a matter of “strategic detachment.” A few new temporary screw holes were necessary to make this a one-man job, but those holes will be hidden and they’ll come in handy for maintenance access later. Here’s the aft bus bar with the red and black covers removed. Load (red) on top and ground (black) on the bottom. Note that DC circuits in vehicles commonly use red and yellow, but the colors ultimately don’t matter as long as you’re consistent. The cable from the switch will connect to the larger posts on the left end of the bar with 12-gauge cable. 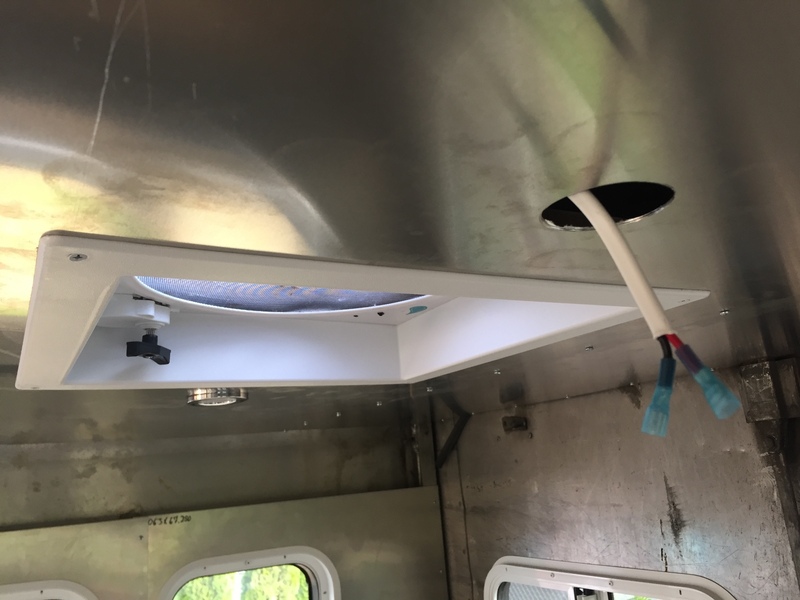 The hardest part was drilling four new 3/4″ holes in the ceiling ribs and getting the rubber grommets in place. But connecting my pre-terminated wires was super easy. This wiring task leads me to believe that I need to adhere 2-inch rigid foam insulation to the top of the cavity, and leave a 1-inch gap below that for wiring. Fiberglass batting would certainly be more flexible, but I hate handling that stuff and it just gets filthy over time. Here’s one of the cables dropped down through panel T6, ready to plug a light into. You can see a connected one on the other side of the vent. I’m planning to test this circuit soonly.